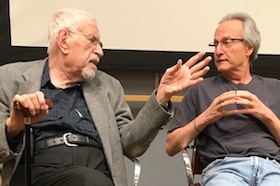 Elio Schaechter (left), Roberto Kolter (right). As this blog enters its second decade of life, it is my honor and personal pleasure to announce that my friend and colleague Roberto Kolter has joined the team. He and I will act as co-bloggers. Roberto is a distinguished re­sear­cher who has made outstanding contributions to central aspects of bacterial physiology, evolution, and genetics. He brings to this task a vast experience as a teacher and writer. He's distinctly a "big picture" sort of person, which will certainly enrich the scope of this endeavor. I am most pleased and grateful. Roberto: I feel Elio has been a close friend and mentor since I was a graduate student in the 1970s. Our common experience of growing up in Latin America, he in Ecuador and I in Guatemala cer­tain­ly helped catalyze the beginning of our long lasting friendship. Thus, I was honored and thrilled when Elio and the team at Small Things Considered invited me as co-blogger. I very much look for­ward to being able to contribute to this most remarkable endeavor. Since 1983, members of the Kolter Lab at Harvard Medical School have been pursuing an eclectic collection of questions in bac­terial physiology, evolution and genetics. Please visit the Kolter Lab website to learn more.